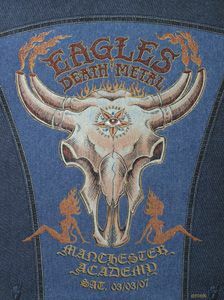 Eagles of Death Metal at Manchester Academy 1, Manchester, UK on 03/03/07 by emek. One of the most sought after of all Emek's posters, although this is really a work of art. Printed on Denim and hand finished with sparkling glitter and rhinestones each piece is unique. From Queens of the stone age QOTSA to EODM Eagles of death metal emek has produced a range of unmatched work. Strictly one per person, household and paypal account.